Called the Boltight Echometer, the device is used for monitoring critical bolting applications either during the installation of new plant or while carrying out routine maintenance. The Echometer works by measuring the time of flight of a sound wave as it travels through a bolt. When the wave hits the end of the bolt it reflects back into the transducer. This enables a measurement to be taken. Depending on how the device is set up, a reading is displayed in units of load, stress or strain on a handheld screen the size of a mobile phone. If a measurement is taken before and after a bolt is tightened, the difference between the two readings provides the bolt's elongation. The benefit of using ultrasound technology is that the wave travels at a constant speed determined by a bolt material's acoustic velocity. The Echometer works with all bolt tightening systems and it is especially useful for monitoring difficult to access bolts. A bolt is monitored during the tightening process to ensure accurate initial loading and the retained load in the fastener can then be monitored at any time. With built-in data recording and reporting through an RS232 interface, the device provides a permanent electronic record of the measurements taken during previous in-service examinations. This makes it easy to maintain documentation, reports and bolting databases in order to satisfy QA requirements. To complement the operation of the Echometer, Boltight has put together a dedicated website to provide further information at http://www.echobolt.com. As well as explaining in detail how the device works, the website features a fully functional online demo of the product. This illustrates how the Echometer operates and provides examples of the readings that will be displayed on the handheld unit. 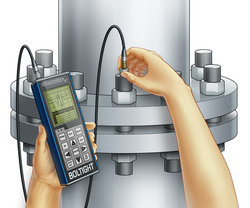 Echometer training is available on-site or at Boltight's training facilities to give technicians the necessary skills to use ultrasonic measurement competently. For more information contact Boltight on +44 (0)845 500 5556, email sales@boltight.com or link to the website www.boltight.com.